Buffalo Chicken Salad | Relish! 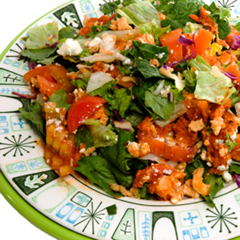 All the flavor of Buffalo chicken wings is packed into this delicious and healthy salad. Season the chicken with salt and pepper. In a large skillet over medium heat, add the canola oil and brown the chicken on all sides, about 3-5 minutes total. Combine the chicken and buffalo wing sauce in a slow cooker. Shortly before serving, cook the bacon in a small skillet until crisp, about 7-9 minutes. Transfer to a paper towel-lined plate and crumble when cool. When ready to serve, combine the lettuce, tomatoes, carrots and celery. Divide evenly among plates and top with the blue cheese crumbles, bacon and chicken. Drizzle evenly with dressing and serve.